Changes in temperature and precipitation are expected to influence ecosystem processes worldwide. Despite their globally large extent, few studies to date have examined the effects of climate change in desert ecosystems, where biological soil crusts are key nutrient cycling components. The goal of this work was to assess how increased temperature and frequency of summertime precipitation affect the contributions of crust organisms to soil processes. With a combination of experimental 2°C warming and altered summer precipitation frequency applied over 2 years, we measured soil nutrient cycling and the structure and function of crust communities. We saw no change in crust cover, composition, or other measures of crust function in response to 2°C warming and no effects on any measure of soil chemistry. In contrast, crust cover and function responded to increased frequency of summer precipitation, shifting from moss to cyanobacteria-dominated crusts; however, in the short timeframe we measured, there was no accompanying change in soil chemistry. 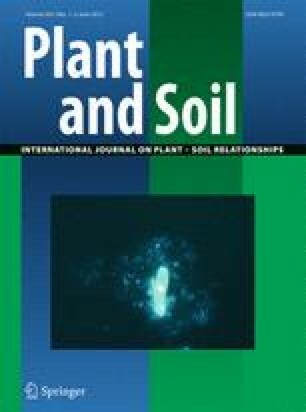 Total bacterial and fungal biomass was also reduced in watered plots, while the activity of two enzymes increased, indicating a functional change in the microbial community. Taken together, our results highlight the limited effects of warming alone on biological soil crust communities and soil chemistry, but demonstrate the substantially larger effects of altered summertime precipitation. Responsible Editor: Jeff R. Powell. The online version of this article (doi: 10.1007/s11104-011-1097-z) contains supplementary material, which is available to authorized users. Thanks to DOE PER program and Jeff Amthor for providing funding for this project. Thomas R. Weicht, Nicholas LeValley, Henrietta Oakley and Koela Ray provided technical support in conducting extracellular enzyme assays and Kelly Ramirez provided helpful suggestions for extracellular enzyme analyses. We also thank S. Phillips, M. Turner, P. Ortiz, A. Atchley, A. Collins, J. Aylward, B. Graham, K. Markland, T. Orbiz, and many more for help in the field and with lab analyses. We are grateful to M. Bowker and two anonymous reviewers for suggestions that greatly improved the manuscript.